S0717. 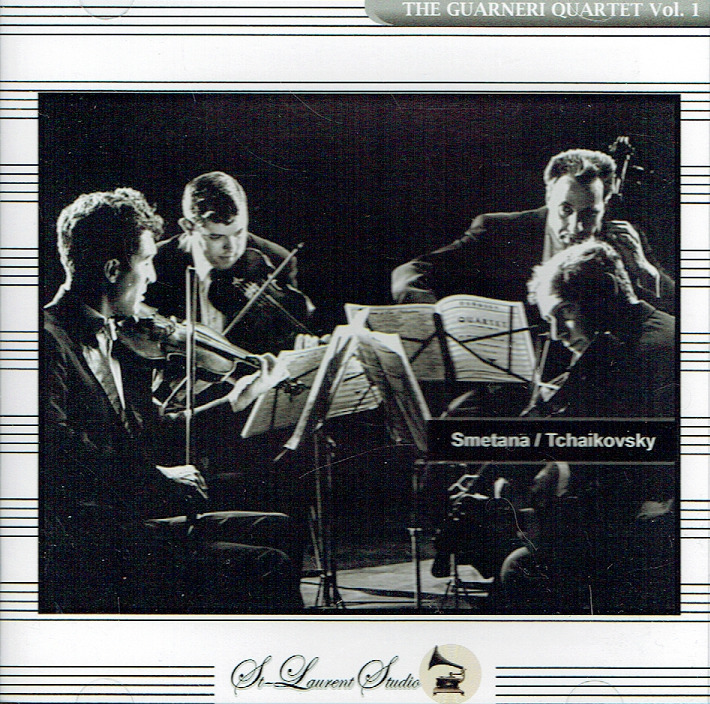 GUARNERI QUARTET: Quartet #1 in e 'From my life' (Smetana); w.Boris Kroyt & Mischa Schneider: String Sextet in d 'Souvenir de Florence' (Tschaikowsky). (Canada) St Laurent Studio YSL 33-698, recorded 1965-66. "Until the year 2000, the New York City-based Guarneri Quartet consisted of the same four players who comprised the group at its 1964 founding: Arnold Steinhardt (violin), a former assistant concertmaster under Szell in the Cleveland Orchestra; John Dalley (violin), a one-time member of the Oberlin Quartet; Michael Tree (viola), formerly a highly respected concert violinist who converted to the viola; and David Soyer (cello), previously a member of several chamber ensembles, including the Bach Aria Group. Few chamber groups have maintained both the same personnel and such a consistent level of renown for so enduring a period. In 2000, Peter Wiley replaced David Soyer as the group's cellist. He is a former member of the Beaux Arts Trio. The Guarneri Quartet's roots date to the 1964 Marlboro Festival, where as individual musicians they appeared with various ensembles and with pianist Rudolf Serkin. At the urging of violinist Alexander Schneider, the group collectively agreed to form a string quartet, taking their name from the famous Italian family of violin makers. It quickly achieved critical acclaim with 1965 appearances at the Spoleto Festival and Metropolitan Museum of Art. The group has since regularly appeared at the latter venue and have established other such recurring events, such as the Lincoln Center-based series entitled Guarneri and Friends, which began in 1973. The Guarneri Quartet also made immediate headway in the recording venue, with its traversal of the 16 Beethoven quartets (and Grosse Fugue) for RCA, issued from 1966-1969, which received several prestigious awards. The group gave highly acclaimed performances of all the Beethoven quartets in a historic 1970 series of concerts in London. 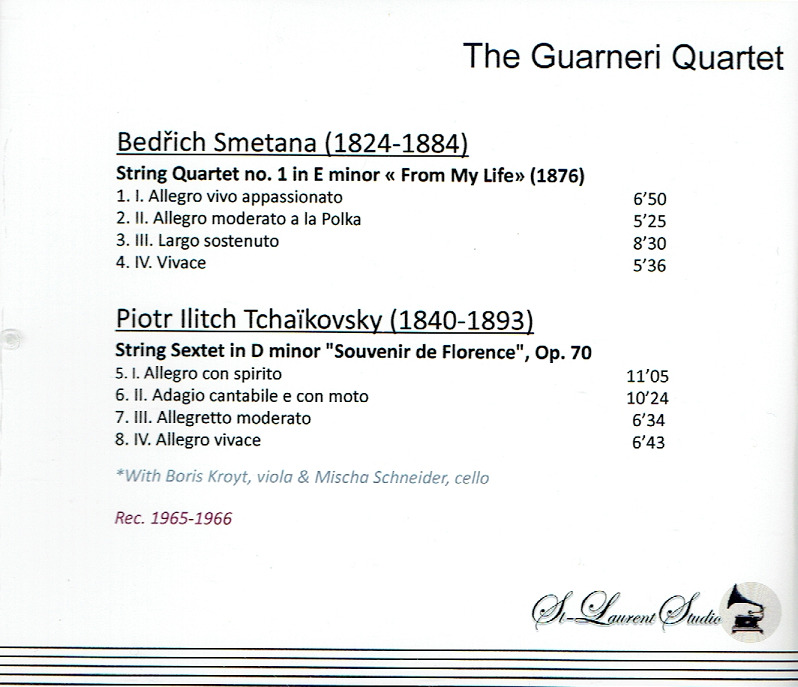 For the first decade or so of its existence, the Guarneri players had developed a reputation largely associated with eighteenth and nineteenth century repertory staples, but in the mid-'70s, the group shifted its focus to include important works from the twentieth century, like the six quartets of Béla Bartok, which the quartet also recorded to critical acclaim. Its repertory would later broaden to include not only works by Stravinsky, but Henze (piano quintet) and Rorem (String Quartet #3). Most of the group's early recordings appeared on RCA, but they moved to Philips in 1986, their first issue coming late that year with the Smetana String Quartet #1, 'From My Life'. They re-recorded much of their repertory for Philips including the Beethoven quartets. In the late 1990s, the group also started issuing recordings on the Arabesque label and in 2001, they made their first compact disc for a new label - Surrounded by Entertainment. 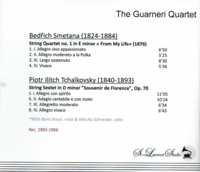 The Guarneri Quartet has also garnered numerous awards apart from those associated with its many recordings. In 1982, New York's Mayor Edward Koch gave the group the New York Seal of Recognition and the State University of New York (S.U.N.Y.) issued members honorary doctorate degrees in 1983, their second such citation, the first coming in 1976 from the University of South Florida. The Guarneri Quartet has also reached its audiences via numerous broadcasts over radio and several appearances on television, including a particularly notable one from 1990 on the CBS Network's Sunday Morning program, hosted by Charles Kuralt, which featured an interview with the players. The group was also the subject of a 1989 film entitled High Fidelity - The Guarneri String Quartet. Several books have focused on their artistry as well, including the 1986 Alfred A. Knopf publication THE ART OF QUARTET PLAYING: The Guarneri in Conversation with David Blum. In 1998, Farrar, Straus, and Giroux published Arnold Steinhardt's own book INDIVISIBLE BY FOUR: A String Quartet in Pursuit of Harmony."